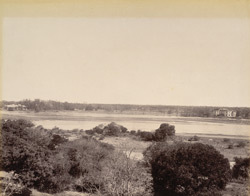 Photograph of the Adyar River at Madras (Chennai), Tamil Nadu, from the Macnabb Collection (Col James Henry Erskine Reid): Album of Indian views, taken in c.1902. Madras is situated on a low-lying, level site on the Bay of Bengal and is intersected by two rivers, the Cooum and the Adyar. This is a general view of the Adyar, which flows in a winding fashion from west to east near the southern boundary of the city. Neither river was fast flowing, and except during the monsoon, they both formed salt lagoons at the coast separated from the sea by narrow ridges of sand. The strip of land on the north bank of the Adyar was one of the principle European areas of residence and fine houses were built on its banks by Company officials in the 18th and early 19th centuries.